Attractive though this board is in price at least, it measures about the size of a credit card, it is quite hard to get one I know I have been waiting 4 or 5 months since I knew I could place an order and still don’t have one. I don’t know how true this figure is but am lead to believe some 350,000 people have ordered and waiting delivery for their Raspberry PI Board. 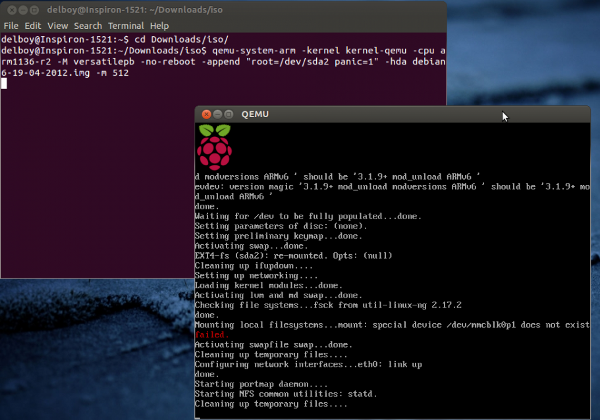 If you cant wait to try Raspberry PI you can at least emulate the operating system and it’s processor using a method described below. The board itself may be a good price but you may also need to buy ancillary equipment to use it, which could cost you as much as the board itself. You need to install a qemu-kernel I found mine here. You will also need the disk image which I obtained here. Only the Arm – arm1136-r2 processor works for the instructions detailed bellow, if you know differently please comment bellow. This is the command line in its entirety you can if you want add -m 512 if you can spare the memory for it. 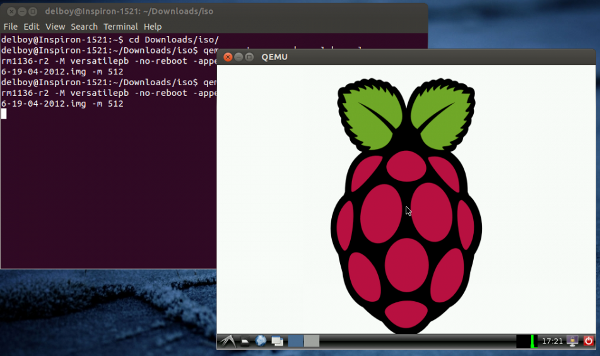 Once you have the login prompt you will need to enter the username “pi” in lowercase and without the quotes that surround it, you will be prompted to enter a password and you should use “raspberry” for the image distro we are using above and again lowercase and without the quotes. That in a nutshell is it, this should get you running if you can help obtain a working solution for better graphics and resolution please comment below. Git is an open source version control system. Git is developed and maintained by the creator of the Linux kernel. Git stores complete files each time the user commits his changes, making recovery and version-diffing reliable, responsive, and simple. This is in contrast to other version control systems which store complete versions as “Deltas” or descriptions of the changes between versions of a file. If a file has not changed between commits then Git simply links to the last changed version. It is an experiment really the above procedure works well enough but does not produce any resolution other than 640 x 480 which is pretty pants really, especially for presentations and demonstrations. So it was felt a later build would allow us to increase the window resolution – hopefully. Without any variation to the command line code above there was no change in output it was still 640 x 480. If you have a machine that has a multicore uProcessor you may want to use -j n option were the “n” signifies the number of processors but is not strictly necessary, you can use the option like this. Whilst following this proceedure, I found a couple of gotchas. 1. The sha1 value did not match the zip file, but the value inside the zip matched the un-zipped .img file. 2. The kernel-emu file specified, downloaded with the extension “.bin”. The launch command or the file name needs to be changed. Either worked for me. So far, so good. The grahical screen has come up with a blue raspberry, and no mouse control. 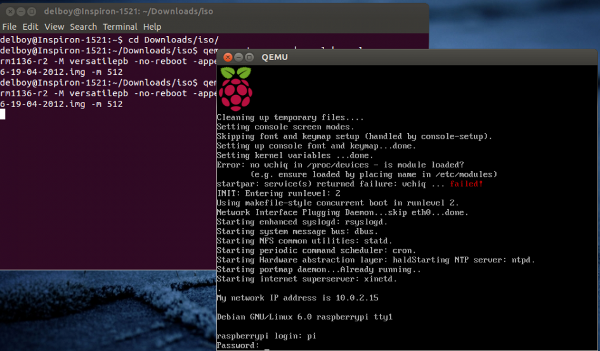 I don’t understand why we need it, unless we want to access the host’s filesystem from the virtualised RPi. Moreover, once the machine is started, I don’t actually see the host machine’s file system anywhere. 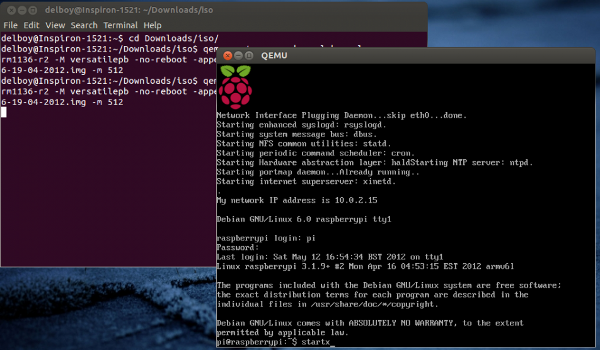 I have also tested that, if I try omitting that parameter, the emulated RPi does not boot, and I don’t understand why. Current recommendation is to try ‘arm1176’ first. If it doesn’t work then you likely have an older version of qemu and should upgrade.